I hope you’ve enjoyed my Top Ten Things to See and Do in Munich. Remember, this list is a compilation of my personal favourites – there are hundreds of other sights, restaurants, tours and landmarks (like theOlympia park, which was very close to making it’s way onto this list) that you could choose to see. It’s also important to remember that Munich is a city of festivals and depending on what time of year you come, you may want to check out seasonal festivals like Oktoberfest, or Tollwood, or a visit a Christmas Market if you arrive during the winter season. Munich.de is a great resource to keep you up to date on fun and exciting events and festivals taking place throughout the city all year round. If, however, you are strapped for time with 1-3 days to spend in this amazing city (and trust the author) then I welcome you to adopt this itinerary and bathe in all wonder, history and tradition that Munich has to offer. 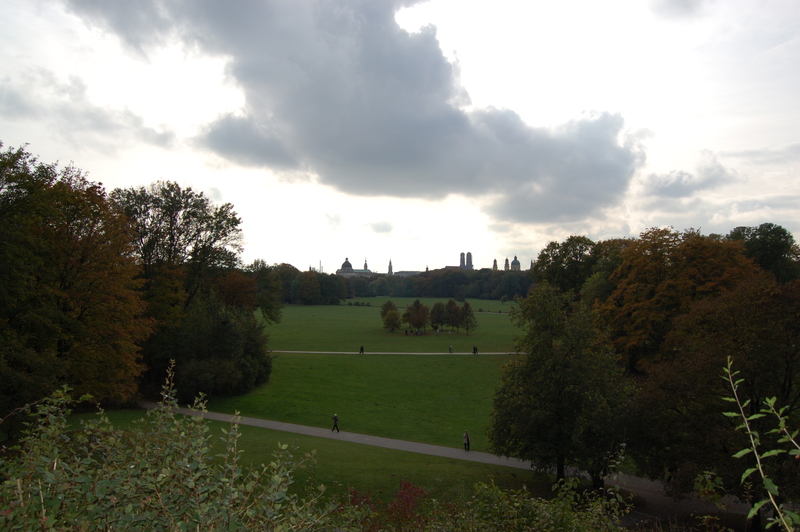 The Englischer Garten is an immense park found steps away from the city center (literally, steps). Trails wind their way through various sections of the garden, each informally categorized as the place to grille (BBQ), or tightrope walk, kick the ball around, or lay naked under the summer sun. Yup! That’s totally legal here. You’ll find streams, ponds, small waterfalls and even surfers catching the waves at the Eisbach, a man made river that feeds into the Isar. If you’re in Munich for more than a couple of days, the Englisher Garten is a great place to go jogging, forming a loop that can be followed all the way back to the Lugwigstrasse, so you can turn around at any point without getting too lost. If you have limited time in Munich, reserve an afternoon (or at least part of it) for a picnic and stroll through the garden. Stop at the Chinesisicher Turm (Chinese Tower) for a beer, a pretzel and some Obatzda, a deliciously creamy, melt-in-your-mouth mixture of cheese, garnished with paprika, salt, pepper etc. Stay long enough to hear some folk music being played by an Umpapa band dressed in lederhosen and dirndls and then move on to the next attraction. Read the original post and more travel tips including the entire Best of Munich series, on Travel Dudes! Hi, you are right: the best place to get to know the atmosphere of München is to go to the Englischer Garten. But what about culture? Alte Pinakothek, Neue Pinakothek, Pinakothek der Moderne!!! You’re so right… wish is why Munich really deserves more like a top 50, then a top 10! This series was inspired by so many friends who would ask what to see in two days while in Munich! It was hard to pick just 10 but I tried to give an honest account of my favourite things to do in (and around) the city! If I had made a longer list, I definitely would have included the Pinakotheks, the Deutches Museum, the Olympiazentrum and more! Thanks for your comments Reinhard! Tschuss!